Having less than a third of this season's FA Cup third-round matches in the traditional 3pm kick-off slot "diminishes the magic of the day", a supporters' group has claimed. Only 10 of the 32 fixtures will start at that time on Saturday, 5 January. The Football Association's new six-year, £820m overseas TV contract has contributed to a number of changes. "There's a grave danger that they might threaten the magic of the FA Cup," the Football Supporters' Federation said. The overseas TV deal, which has come into force this season, was announced by the FA in October 2016. However, FSF chairman Malcolm Clarke said his organisation had been taken by surprise when the third-round fixture list was revealed. There will be one match on the evening of Friday 4 January, seven will kick-off at 12:30 GMT and five at 17:30 on the Saturday. Eight matches will be played on the Sunday, most at 14:00, while Wolves face Liverpool on the Monday evening. Clarke said he is now seeking a meeting with the FA to discuss his concerns. "The third round of the FA Cup on the first Saturday in January was always one of the great highlights of the season, and to have less than one third of the games kicking off at three o'clock on Saturday definitely to some extent diminishes the magic of the day," he said. The FA defended its television deal, pointing to the benefits for grassroots football and reinvestment at all levels. 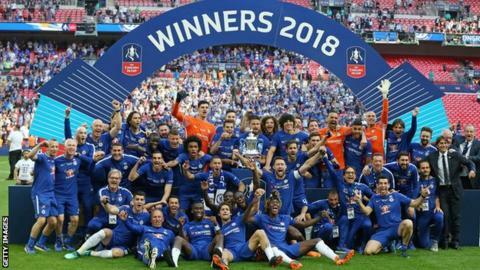 An FA spokesperson said: "A selection of the Emirates FA Cup third-round fixtures have been picked for domestic and overseas television coverage as part of the new international broadcast deal for the competition. "The new deal, which began this season, will see more money than ever before reinvested back into English football and prize money doubled to over £30.2m - with a guaranteed £4m distributed to non-league clubs. "In addition, the new deal will provide an increased level of investment into grassroots football pitches, facilities and participation programmes across England."